You will need to use Internet Explorer as your web browser. The Global Perspectives resource does not work correctly with Google Chrome, Safari, or Firefox. Internet Explorer can be found on your Start Menu under programs or by searching for Chrome by typing into the search box when you click on the Start Menu. If you don’t have Internet Explorer installed on your computer, go to http://windows.microsoft.com/en-us/internet-explorer/download-ie and download the Internet Explorer browser. 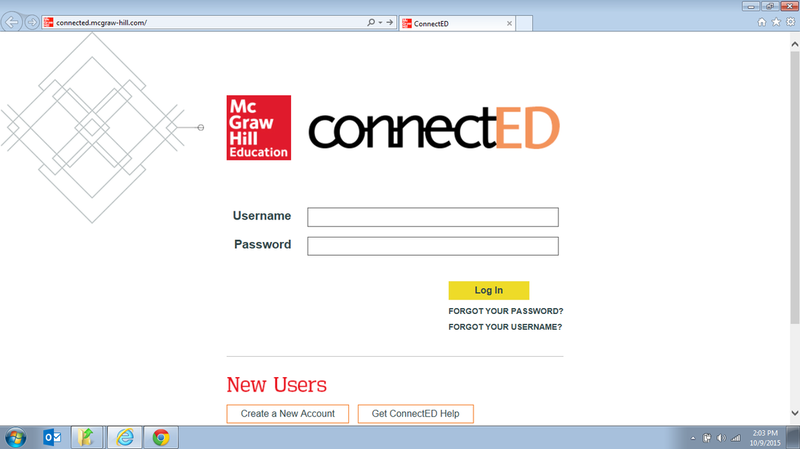 Step 2: When Internet Explorer opens, type connected.mcgraw-hill.com into the address bar. Step 3: ​The username and password are similar to your NHA credentials. These are the same username is the one used at the Riverton Library and on all Riverton computers. The password is the same as the Riverton password with the numbers 123 added on the end. The Password is your first name + 123, all lowercase.